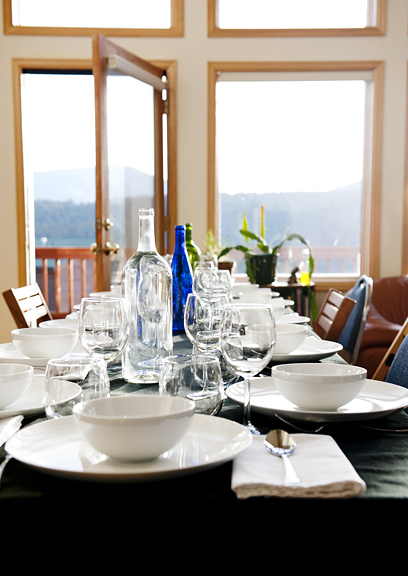 I think everyone knows just how much I enjoy having friends over to share a meal. Feeding others is an act of love in my book. 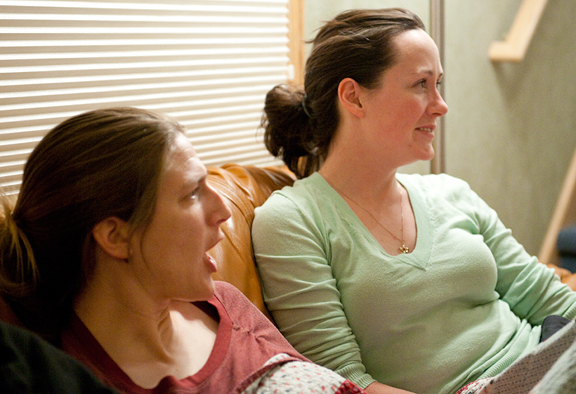 The conversations that take place – from inane to serious – are never short of entertaining. Don’t be fooled into thinking that every day in the Colorado mountains looks like that. We had originally planned our potluck for the weekend, but that fickle March mountain weather dealt us some mean ice and snow. Everyone agreed to reschedule, because it was important. This wasn’t any old potluck. PBS POV contacted me a couple of weeks ago to ask if I’d be interested in hosting a potluck and a screening of the documentary Food, Inc..
Had anyone else asked me to do this I would have laughed until I cried because my March schedule is 200% overfull. But I have a soft spot for PBS and the issue of where our food comes from is an intricate and complex one that concerns me greatly. Yes. Yes, of course I’d love to participate. The overwhelming response from my friends indicated that they had a lot of thoughts and questions on the matter too. 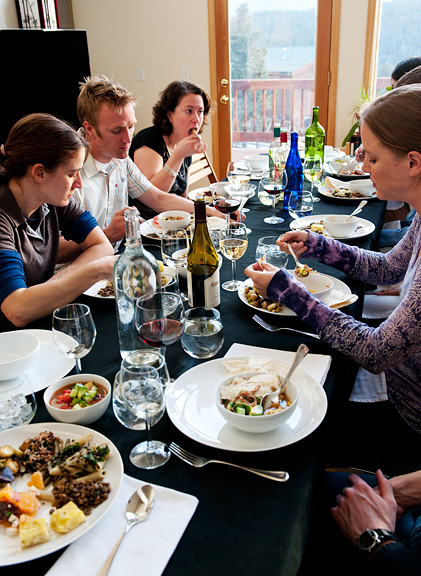 Hosting a potluck that highlights healthy, local, and sustainable foods in Colorado in March is no trivial task. If anything, it forced me to scrutinize my purchases more carefully. Most of the produce I used came from Colorado, Arizona or California. The meat was organic (bacon) or the least offensively raised pork I could find (pork shoulder for the posole). My posole had some regional special ingredients that I had saved in my freezer and pantry: roasted hatch green chiles from New Mexico, frozen posole (white hominy) from the Santa Fe farmer’s market, and dried red New Mexican chiles. [I bought the reds in New Mexico last fall and my aunt scored me the green chiles and posole.] 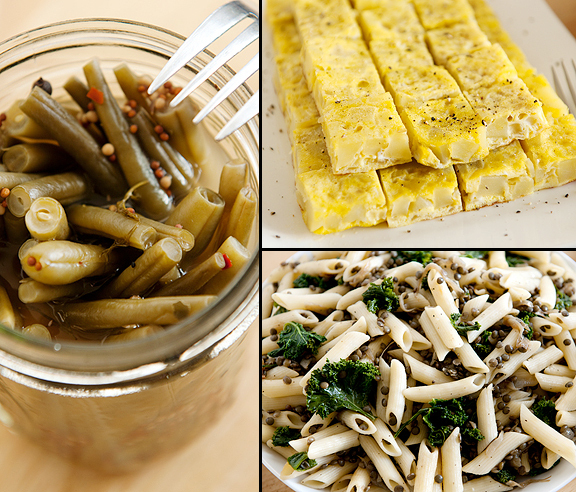 Our guests brought a variety of wonderful vegetarian dishes including pickled beans from their own garden! The logstics of a surprise are always complex and so we had to start the dinner without some of our guests (Beth was picking up Marianne’s sister who flew in for a surprise visit this week). 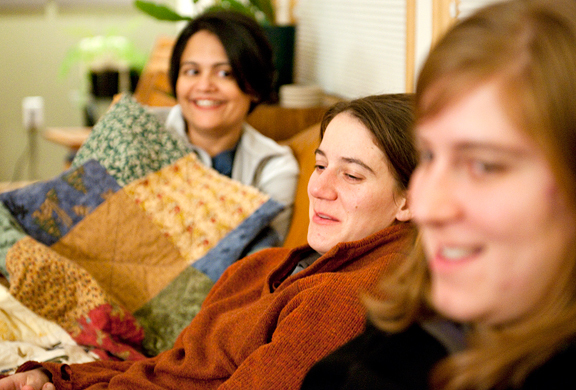 Eventually everyone trickled in and the house was full of reunions and happy conversations. 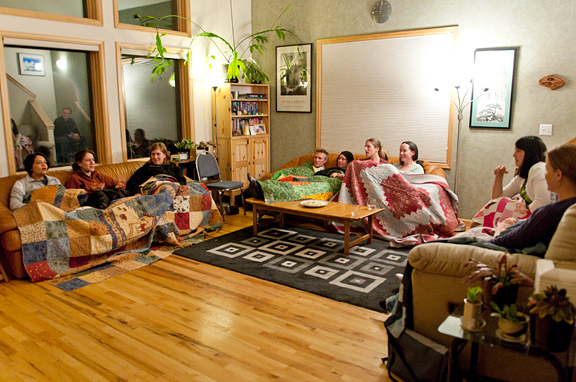 As the plates cleared, we broke down the tables so folks could retire to the couches, huddle under the quilts (just in case you thought the next set of photos looked suspiciously like a slumber party), nibble on lemon macarons, and watch the feature documentary Food, Inc.
Food, Inc. is a 94 minute documentary that forces you to think, really think about what the food industry is producing, what you are eating, and all of the social, economic, agricultural, moral, energy, political, legislative, environmental, and public health consequences intricately tied to these issues. If you eat food, you should care and you should watch this film. Our post-screening discussion was lively. 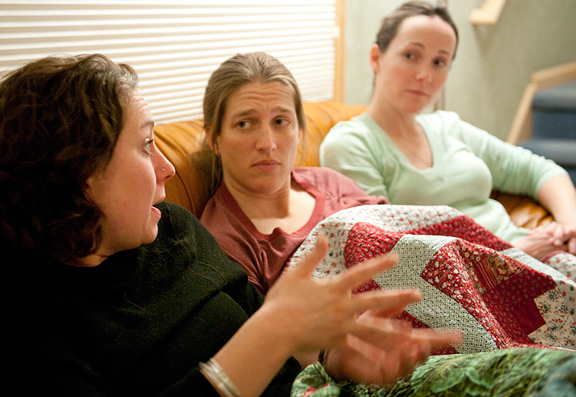 Even though it was a weeknight and it was late, people still wanted to talk and the topics were broad and deep. Several in the group have science backgrounds (geology, biology, physics), but we also had engineers, an environmental engineer, programmers, and an economist. There isn’t enough room on this page to do the discussion justice, but I’ll hit on some key points that stood out that evening. The most obvious to us was that large corporations involved in the food industry are more concerned with profit than with the public’s well-being. People were floored to learn of the blatant infiltration of industry insiders into the top regulatory and advisory ranks of our country’s government under both Republican and Democratic administrations. It is a veritable revolving door which perpetuates the monopolies and oligopolies that dictate what and how we eat. Some of those monopolistic companies bring SLAPP (strategic lawsuit against public participation) lawsuits against small businesses or individuals who can’t afford to fight them in court, just so they go out of business or conform to the company’s demands (like forcing them to purchase the company’s seeds or products). Did you know that in the state of Colorado and other states you cannot libel food? These are called veggie libel laws. Where do you draw the line between husbandry and genetic manipulation? We pointed to Kaweah and said she was a perfect example of a GMO (genetically modified organism) through selective breeding. But what about insertion of animal genes into plants? There is great concern over the issue of biodiversity. The homogenization of food crops makes the food supply vulnerable to widespread devastation by single events or diseases. The small farmer in America is getting screwed. We don’t pay what food really costs. The true cost of food should include environmental impact, energy consumption, packaging and waste, health. Heavily subsidized products like corn find their way into all manner of processed foods (and things you wouldn’t eat) and so the crap foods are cheaper than the wholesome foods. That’s no way to feed a country. 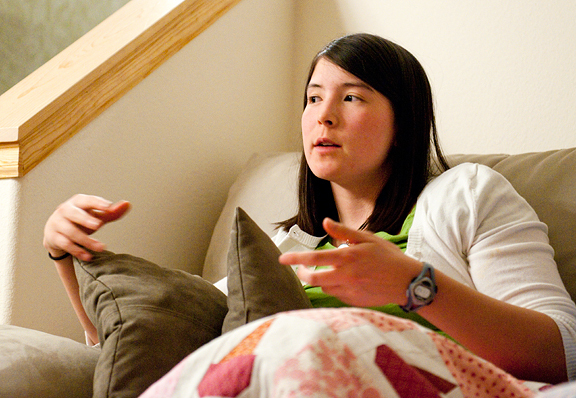 Beth asked how many of us grew up sitting down to dinner and eating with the whole family. Almost all of us raised our hands. I think there is a strong connection between what we learn about food growing up and what we end up eating as adults. A generation of people raised on junk and convenience foods aren’t in a very good position to teach their children how to eat a healthy and sustainable diet. We talked about waste and methane production, the benefits and drawbacks of organics expanding into big box markets (Wallmart), water rights, consumer rights, how illegal immigration crackdowns target the immigrants, but not the companies who hired them, the financial entrapment (Jeremy calls it indentured servitude) of small farmers to the dominant companies. I’m sitting in a cafe on the road to Utah for a shoot – short on time (aren’t I always?). It’s not because I don’t have the time to talk about the issues so much as there are far too many issues to discuss at length. Food is an integral part of civilization. It is one of the three essentials for life (food, water, shelter) and it has been commoditized while some believe it is a human right. We need to have a discussion, educate one another, share, learn. You can join the potluck too. PBS POV is airing Food, Inc. on April 21, 2010. 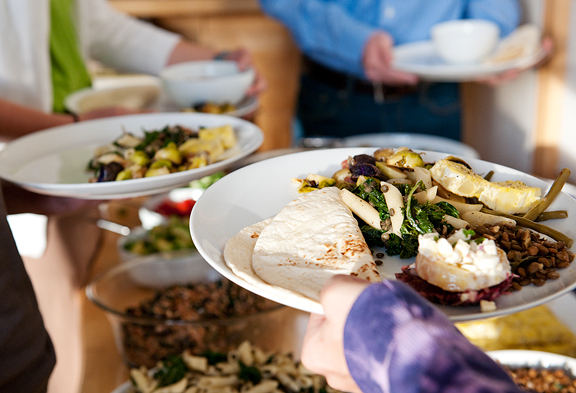 It’s a great opportunity to host a potluck of your own. Gather your friends and family together and watch the documentary on television or you can view Food, Inc. online from April 22-29, 2010 (click on the link). Talk about it. Then visit the site between April 22nd and May 3rd to enter PBS POV’s giveaway which includes autographed books from Michael Pollan and Eric Schlosser, a copy of the Food, Inc. DVD, sustainable food items, gift cards and other great prizes. I was thinking about what I said at the beginning of the post – that feeding someone is an act of love. If you love someone, you probably wouldn’t knowingly feed them some of the “food” that churns out of corporate factories. But a lot of people do just that because they don’t know better, they don’t know the truth about what goes into the food we are sold. And then some simply cannot afford to eat well, to eat healthily. How can junk food be cheaper than healthy food? Think about it. Then maybe you’ll want to do something. And maybe we can make a change. Right, so there IS a recipe because these meyer lemon French macarons are too good NOT to share. 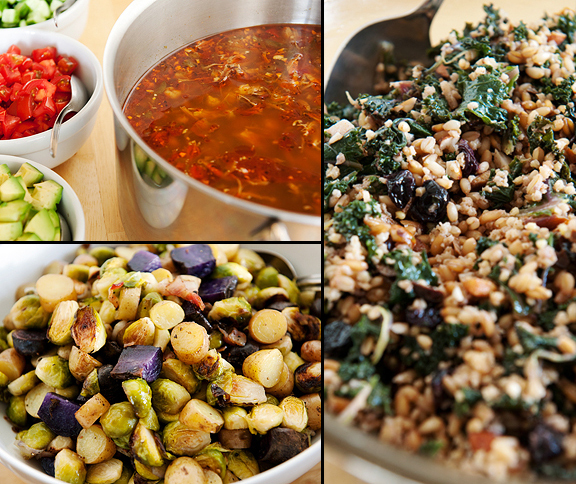 Just ask my potluck guests, they will vouch for them. The recipe comes from my dear friend, Helen who is the high priestess of French macs. If ever I think about a flavor combination to try, I always check her blog. I’ve made several varieties of macarons and this one isn’t too different other than the lemon curd filling. I have nothing against buttercream or ganache fillings, but I think the more curd-like fillings are more to my liking. I know this because within the span of a few weeks I sampled the best macs San Francisco had to offer (thanks to Anita, Lisa, and Helen!) and some straight from Ladurée in Paris (thanks to Marianne!). Don’t worry if the yield on the curd is small. You don’t need much because it’s nice and tart and a little goes a long way. It firms up nicely when you chill it completely in the refrigerator, so be sure to make it ahead of time to avoid a runny mess. I’m not showing all of the steps to making the macaron shells, but you can see some more instructional photos and description on this macaron post. 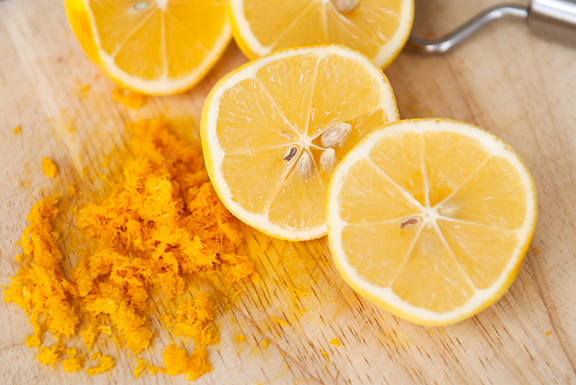 In essence, you add lemon zest to the basic shell recipe. I also tint my granulated sugar with a little yellow food coloring because I don’t have those lovely powdered food colorings. Helen told me once that placing the macs in the refrigerator helps to achieve the chewy, soft texture on the shells, so I tried it. Perfect. I told you she was amazing, as are these macs. 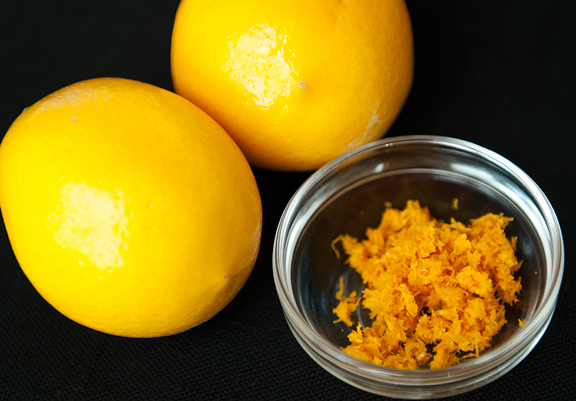 lemon curd: Stir together the lemon zest, juice, and sugar in a small saucepan. Bring to a simmer over medium heat. Beat the yolks together in a medium bowl and temper with the hot lemon mixture (temper: add a little hot liquid and quickly whisk in, then add a little more and whisk in). 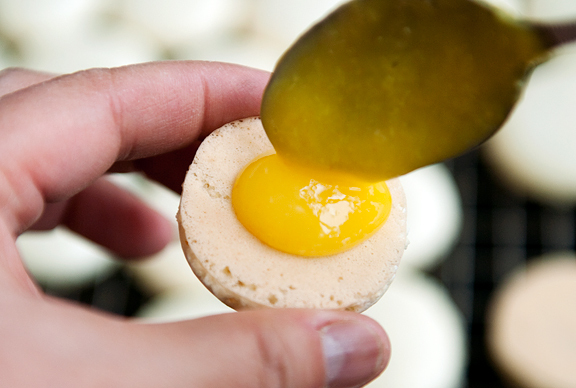 Pour the egg mixture into the sauce pan and stir constantly over medium heat until the liquid thickens (about 5 minutes). Remove from heat. Let cool completely. macarons: Pulse almonds in a food processor until finely ground. 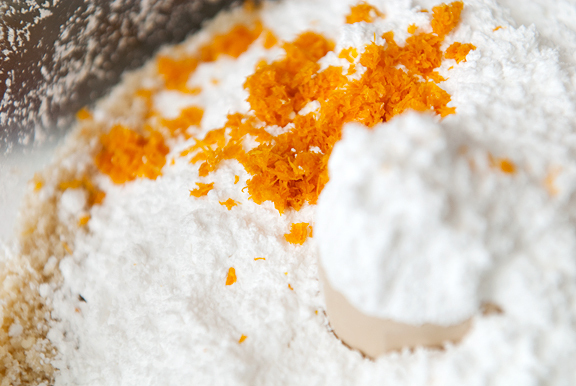 Add powdered sugar and lemon zest. Pulse until well-blended. 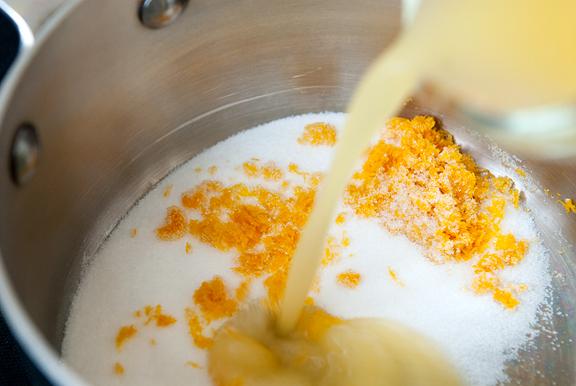 In a small bowl, mix the sugar and food coloring together until well blended (i.e the sugar turns yellow). Whip the egg whites until foamy and gradually add the granulated sugar while whipping until a shiny meringue forms (but not too dry). Add the almond mixture to the meringue and quickly incorporate the mixture into the meringue while taking care not to overbeat. You want to achieve a batter that flows and “ribbons” for at least 5 seconds. 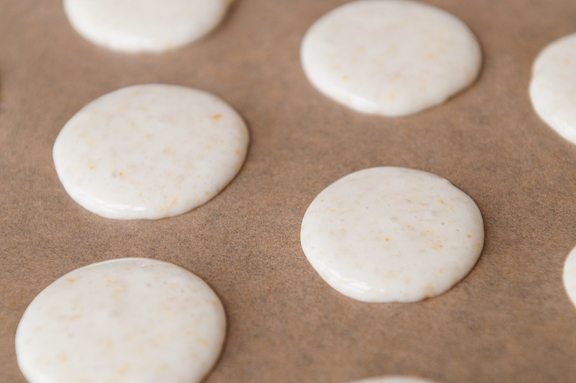 Pour the batter into a piping bag fitted with a large plain piping tip (Ateco 809 or 807) and pipe small rounds onto a baking sheet lined with parchment paper. The rounds should be about 1 1/2 inches in diameter and at least an inch apart. Let the macarons sit for an hour to develop a hard shell (@8500 ft., this takes about 15 minutes for my arid climate). Preheat oven to 300°F and bake for 8-10 minutes (10 minutes for me). Remove from oven and let cool. Remove from parchment. assembly: Pipe a small daub of lemon curd (a little goes a long way) onto a macaron and sandwich with a second macaron. Makes about 2 dozen. Thanks for taking the time to share that evening and the discussion highlights. I was just bitching to my husband the other night that the crap foods are so cheap compared with healthful things like veggies and fruits and how could poor people eat anything but junk. I’ve been hearing about Food Inc. for a short time and we’ll probably tune in. We love PBS and public radio (especially WNYC), so I can understand your accommodating the request. And thanks for the mac recipe. Can’t bake to many macs, eh? Oh Jen, I hope someday my home can be what yours is today– warm, inviting, beautiful, full of good friends, great company, and fantastic food. Perfect, complete, gorgeous. As for the meyer lemon macarons, O.M.G. Will be tuning in from the UK online. These issues are SO important. Thank you for ongoing inspiration! I’m intrigued by your description of this documentary. For the last few years, I’ve been growing some vegetables and preserving as much as I can; what I don’t (or can’t for lack of space) grow, I buy at the local farmers’ markets, and each year I find “holes” in my usual stock- things I forgot about- anything that I find myself relying on supermarket produce bins for, and take notes. I don’t know if it was mentioned in the documentary- likely it was, but I think of my own grandmothers and how they grew up: they didn’t have the luxury of fresh produce at all times of the year and HAD to preserve local foodstuffs to use in the off-season. Those were very different times, yes, and true that dried, salted, pickled or home-canned veggies/fruits aren’t the same as fresh, but I am assured of quality and satisfied that I have taken a step toward cutting down my footprint. 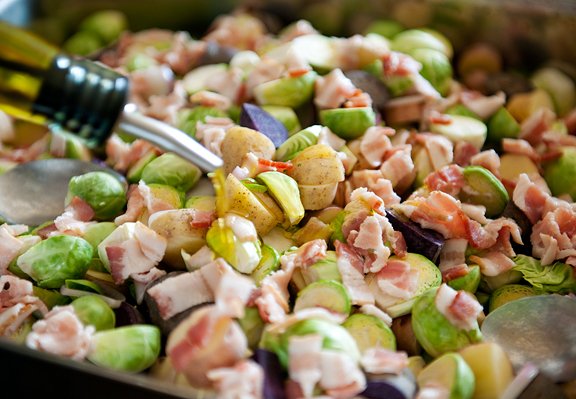 “Winter food” has become a re-discovered concept. I look forward to seeing the issues discussed in this documentary- thanks for bringing it to light! And hey, nice macarons! 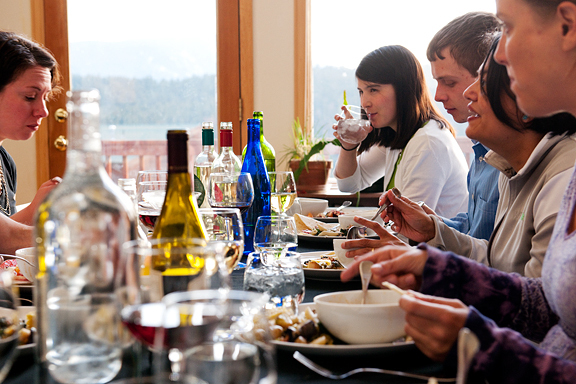 Oh those look wonderful–the friends and the food! I also appreciate your sharing of the documentary. We watched it as a family last week and my children (12 & 13) are quite fired up about those “gross school lunches”. I would also recommend the documentary King Corn, I think that is the name,–it goes more in depth about the overuse of corn products. Great post. Last semester the boyfriend got a copy of Food Inc from his professor. I really enjoyed it. Not, of course, the grotesque truths it revealed, but the fact that the film did it. It was great. I think most of what was said about the documentary is well-known already; however, some people need to be reminded of these truths. Some poor people are unable to eat good food not only because of the reasons you mentioned, but also because they don’t have the time. Some of them have to work so many jobs to support their family, how are they going to cook 1-2 hour meals? Even on the weekends, they may have to work. On a lighter note, though, your macarons look beautiful. I really wish I liked macarons, because you can do so much with them! I watched this movie a few months ago and so many parts of it broke my heart. The little girl who wanted to buy fruit but her family said it was too expensive. (and the family eats at McDonalds, daily) the farmer who was getting threatened, blackballed and sued because he wanted to use seeds not from Monsanto (who sponsors my local NPR and I get snarky when I hear their ads) the mother lobbying on behalf of her son who died from eating contaminated meat and she’s scared of the beef industry suing her for libel. I’ve just recently been aware of this issue, having read Michael Pollan’s Omnivore’s Dilemma (along with his other books, which I immediately got my hands on and consumed), but haven’t had a chance to see Food, Inc. yet. I love food – a lot – but have started to change my eating habits already. What I eat, how often I eat it, where I get it, etc. I know a lot of smart, well informed people that don’t really have this on their radar yet, and undoubtedly will also start to change their eating habits after they see Food, Inc., read Pollan or other authors. Thanks so much for sharing this experience. This sounds and awful lot like a documentary I watched on HULU called The Future of Food. Downright scary. Turned my head that is for sure. As a result, we are eating more local food now, more organic food, etc. They talked about the bioengineering of corn that is going on in this country and how Montesano seed is controlling everything. Attacking small farmers with lawsuits. Its a shame really. I could really go on here but I will stop now. Jen, I just wanted to say thanks for posting about this. I’m reading Omnivore’s Dilemma right now and these issues are SO important. and the long term effects of gmo foods have NOT been completely tested for long term end results/effects in humans. and that same thing happened back 10-20 years ago with the dangers of plastics today. gmo’s are not good, period. our bodies cannot digest/rid of these types of things; just like the bpa’s in plastics–it just sits in the bloodstream, forever. I watched this movie based on your advice and it was an eye opener, to say the least. The topics covered in Food Inc. and the discussion is not new to many of us given the wide number of recalls. I applaud you for raising this issue on your blog; let’s hope that the end customer drives change in our food industry. I have been wanting to watch this documentary ever since i saw its trailer on Youtube. I agree, everyone that eats ‘food’ (which I hope is everybody) should definitely watch this. And I cannot BELIEVE how easy it is for you to just pull out a batch of macarons like that! You make it seem so easy! Thanks for the ‘food for thought’. We, in India, have been able to deffer the introduction of GT eggplant – don’t know till how long we can resist Monsanto and the lures it offers the powers that be. Thanks for the great post! I’ve had this issue on my mind a lot lately. 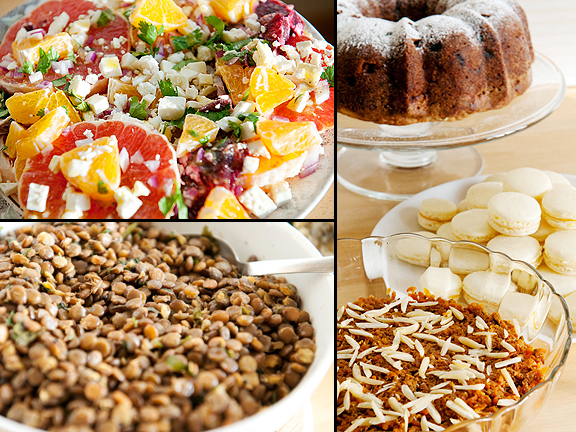 After a discussion with my CSA provider, I started delving into the ‘seedy’ world of seeds. Just finding out that mostly chemical companies like Monsanto and Dupont control about 70% of most plant strains, whose DNA strings they have patented (after gobbling up companies like Gurney, Parks, and Burpee, etc). alarmed us greatly! These companies and their plant investigators that continually threaten the small farmer are starting to get a little “Soilent Green” for our comfort. We are putting in raised beds this spring — ordering from Seed Savers.com and some of the little guys in Maine that still have organic and diversified seeds. I’ve always been a canner and preserver. Takes me home to those sweltering summers of my childhood when we broke home grown beans by the bushels and canned literally hundreds of dozens of jars of beautiful tomatoes. I never peel a tomato without smiling – remembering my mom and those sweat dripping days of summer canning. Gonna make the macarons too! They look beautiful! 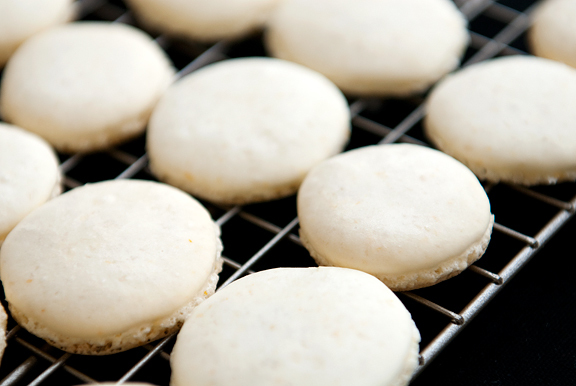 Lemon macarons are among my favourites – especially with a crack of black pepper! These look so yummy! I just bookmarked them! I could live on those lemon macarons! Everything was so delicious. Thanks again for having us, Jen. 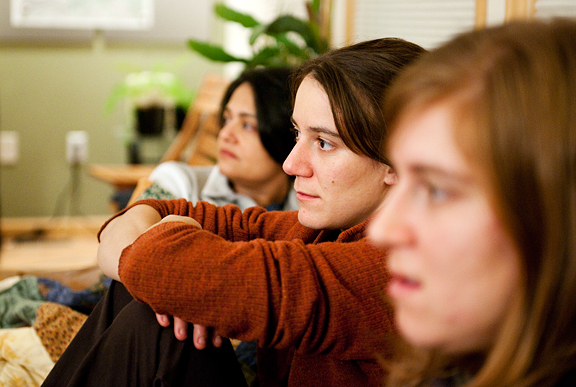 You caught some great discussion faces in your pictures, too. Very interesting and thoughtful post. 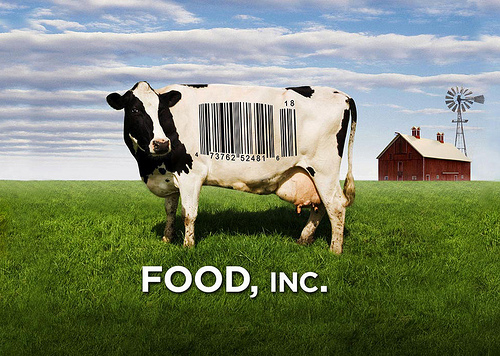 Thanks for letting us know that Food, Inc. showing on PBS. It is definitely more expensive to buy fresh fruits and vegetables vs. the processed foods. I feel really lucky to live in California where there are many local fresh items available through out the year. 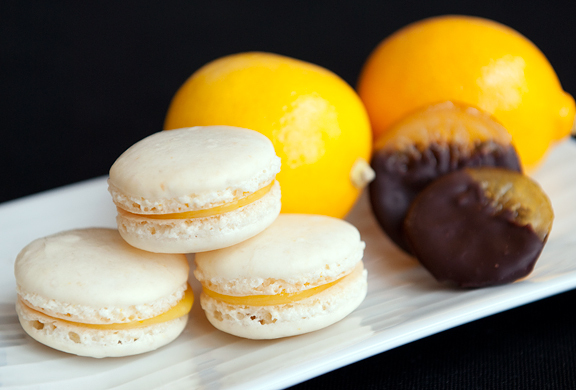 Regarding your meyer lemon macs, they look amazing! I’m going to try the recipe out next weekend if at all possible. I totally love the agenda behind the potluck. And now I’m thinking of hosting my own! It’s been a while since I tried making macs again. I do have some pretty and organic lemons in my fridge. Will it be ok if they ain’t meyer lemons?? What a perfect way to spend time with friends. 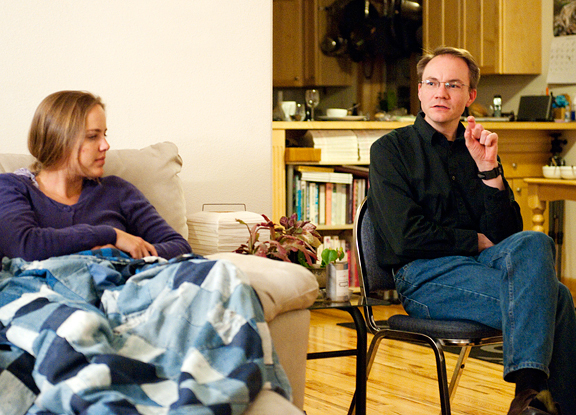 Love the discussion drawn from watching the film too. I haven’t watched it yet, but it’s on my list! the macarons look gorgeous ! this is a great idea on how to use up some lemon curd (I had some frozen for some time remaining from a lemon cake I made using 3 of your recipes together) I eventually gave it away (not that the recipient complained at all) but this would have been a great project ! Netflicks has “Food Inc”, along with some other eye opening documentaries. I wish everyone would watch these and realize where their food comes from. I have heard of this doco and look forward to watching it. A fabulous feast of food you served Jen. It looks delicious….ans someday when I have a decent oven I’ll make Helene’s macarons. Have you visited Mansanto site today. Scary stuff. And I guess this is suppose to be exciting to us. hum. Pelicano – it’s true, there is so much junk out there now that isn’t even food anymore… kudos to you for growing your own. Tawnia – thanks, that is on my “to view” list too! Memoria – well-known by which groups? Sure, it’s well known by people you or I may socialize with, but I can guarantee that the average person does not know about these issues, is in fact, quite ignorant of most of them. We are a very privileged group in that sense, no? You guys rock. I need to sit down and watch that film on the 21st. It depresses me a little, but I need to do what I can. Love all your recent photos…. Love your blog name and pictures! 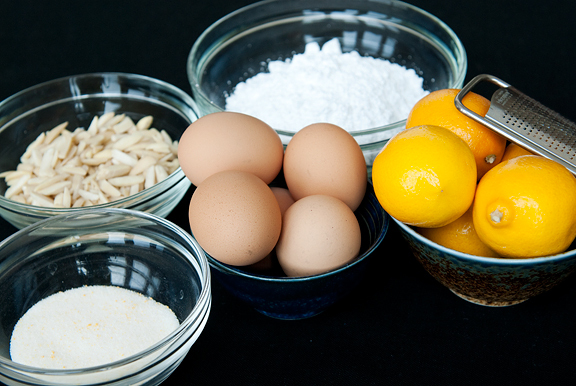 I am attempting the lemon curd today and would love to link the recipe back to your blog! Made your Meyer lemon macarons with lemon curb filling for my coed baby shower cocktail/dinner party this past weekend hosted by my parents and friends. The macarons came out divine. Thanks so much for sharing!